What company is right for my modular school building need? Click to enlarge this modular school building guide. There are several companies that sell and rent used and new modular school buildings throughout the United States. These companies range in size and capabilities and most have available used modular school buildings for rent or purchase if your need is small scale. However, if you are planning to use multiple modular school buildings or have decided that modular is a viable option for building an entire campus - there are only a handful of truly capable firms in the business today. 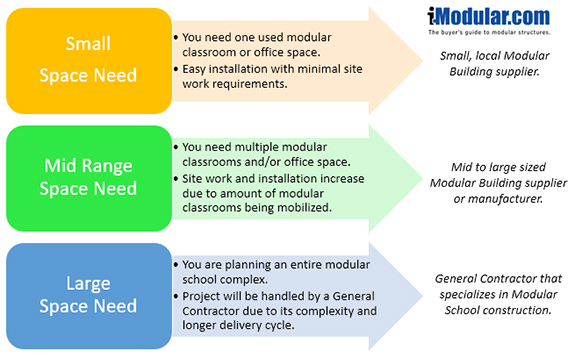 Selecting a modular school building provider largely depends on the size and scope of your project. Above is a simple guide that you can print or forward (use the social share functions to the left of your screen) to anyone involved in your school project. When you are ready to begin interviewing suppliers try using the iModular Supplier and Price comparison tool. Notice that you will need to learn more about the modular school suppliers in your area before you begin discussing your project in detail. Selecting the right sized supplier is important - especially if you have a large school facility need. ➜ What is the supplier's ability to complete the project on time and budget? ➜ How much work does the supplier have scheduled during the time-frame you need them? ➜ Inquire about their bonding ability and financial status. ➜ It is always a smart move to request and check references from recent projects. 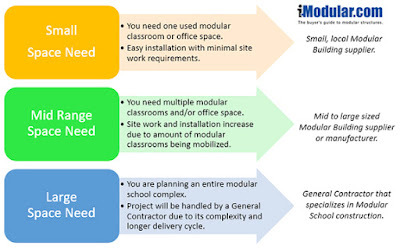 At iModular.com we have been helping schools and churches make smart modular school building solutions since 1998. Hopefully this article has the same effect on you. 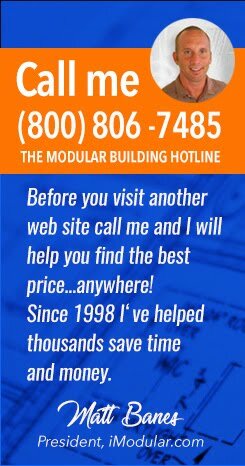 If not or if you have more questions please call the Modular Building Help Line at (800) 806-7485.